Imagine a vest that you put on and you just start burning calories? Well, apparently it exists and it's called Thin Ice. The weight loss vest works by using cooling thermoreceptors placed along the upper chest and back that can stimulate the body's brown fat pathways. Unlike white fat, which stores energy, brown fat cells burn energy to produce heat. Brown fat is activated by cold and can help the body burn white fat (bad fat). So the idea is that turning the temperature down will help you lose weight. To create the cooling effect, there's a set of battery powered Peltier cooling chips built into the vest and a proprietary heat dissipation system. The temperature of the vest is controlled by the Thin Ice companion app that is available for iOS, Android and Windows. Along with monitoring temperature, it'll also show the estimated amount of calories burned and will give you badges when you reach health goals. Created by personal trainer and former NCAA athlete Adam Paulin, the smart clothing range has already successfully completed an Indiegogo crowdfunding campaign where it raised just under $600,000. That first gen version is set to be landing with backers in June this year. 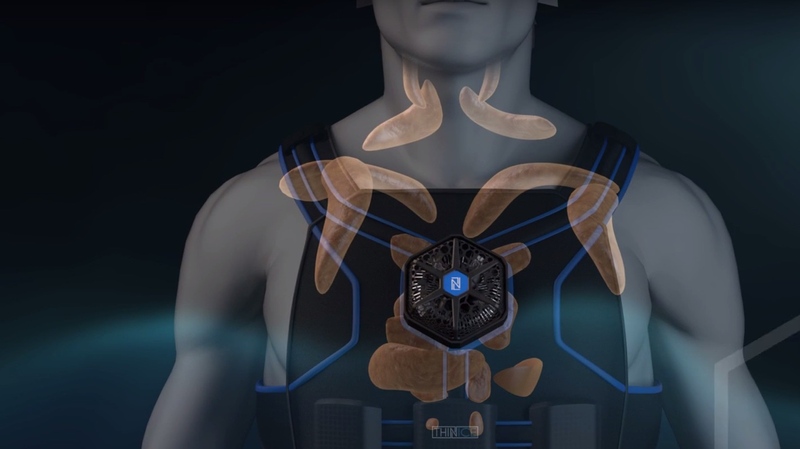 The second generation vest apparently improves battery life performance, body temperature tracking to adapt to changes in the user and environment and will have the ability to wash some of the components of the setup. If you want to pick up Thin Ice 2.0, you can head to the company's Fundrazr campaign page where it has already surpassed its quest to raise $25,000. You can pre-order the vest for a discounted price of $165 with shipping expected in December 2016. For that, you'll get the cooling vest, a digital meal plan, cookbook and exercise routine along with a Joule bracelet. Remember that? That's the wearable that gives you a constant supply of caffeine. We're still going to tag this one under the 'too good to be true' category though. The decision to include a meal plan and exercise routine would suggest to us that it won't just be a case of throwing on the vest and letting the calories burn off while you still tuck away the beers and the pizza.